* Paul Szoldra, an infantry Marine who left the Corps as a sergeant a few years ago and went on the create The Duffel Blog, a satirical website that pokes fun at the absurdities within military culture. * Retired Sgt. Maj. Carlton Kent, the 16th Sergeant Major of the Marine Corps and top enlisted adviser to two commandants. * Max Uriarte, also an infantry Marine, and the original terminal lance corporal who created the popular Terminal Lance cartoon series. Of course, Max also contributes an exclusive strip to Marine Corps Times each week. I checked in today with Paul, Max and the Sergeant Major, and got the gouge on how this extraordinary rendez-vous came to pass. The meeting took place Thursday evening at the Marines’ Memorial Club and Hotel, a San Francisco landmark built in the 1940s. Max and Paul call northern California home. Kent was there on business. In retirement, he co-founded KCK, an organization that works to find jobs for veterans and wounded warriors. Marine Corps Times profiled the venture earlier this year. 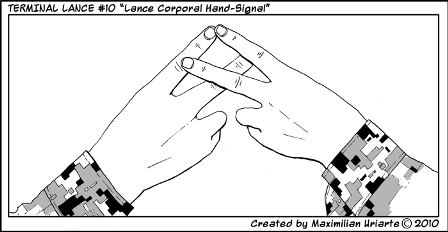 Indeed, Kent earned high praise within the Lance Corporal Underground after some jokesters doctored the tail end of the 2009 Marine Corps Birthday message, creating a clip known as “The Handshake”? Yes, he’s seen it and, no, he doesn’t mind it. Caution: Contains coarse language. Paul and Max, whom Kent called “smart, young hard chargers,” deserve a lot of credit, he said. “They’ve seen the horrors of combat, and they truly have love for our Corps; the EGA is branded in their hearts.” And although Sgt. Maj. Kent is familiar with their projects, he said he is not a habitual viewer of either The Duffel Blog or Terminal Lance. That, of course, was before this epic photo went viral. “I guess I’ll be looking at them more regularly now,” he said.